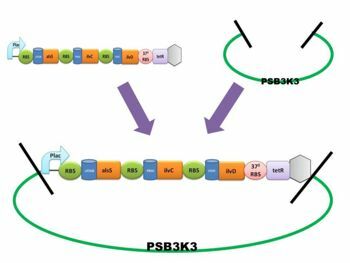 In traditional genetic engineering method, we use strong promoter to initiate our genes, and this way E.coli will overexpress the proteins we need in synthetic pathway. However, this overexpression of target proteins will cause E.coli wastes its limited growth resources, or the activity and performance of the enzymes may be too low. In this situation, it unbalances the synthetic pathway, and the production of isobutanol will not be optimum. This is also a problem in the production of isobutanol which is poisonous to E.coli. Figure 1.Traditional genetic engineering method. To solve the problem, we need to adjust the expression of the genes. We use the cellulose to produce glucose.As glucose can be catalyzed into pyruvate by glycolysis, we chose glucose as the starting point of our biosynthetic pathway. Then, pyruvate will be converted into isobutanol by the enzymes. Glucose can be catalyzed into isobutanol through afterward enzymes- Alss, Ilvc, Ilvd,and Kivd step by step. And we stop at the step to accumulate the intermediates we want (see picture Overall Reaction). The most important gene of our biobrick is 37°C ribosome binding site gene. We designed the temperature release system by this 37°C ribosome binding site gene. We accumulate lots of the non-toxic intermediate as the precursor, 2-Ketoisovalerate, to a certain amount, and then convert the entire non-toxic precursor into the product, isobutanol, all at once.The advantage of our new method is that the precursors are much less toxic for E.coli than our target product (isobutanol) is. Figure.2 Overall conception of isobutanol synthesis pathway. 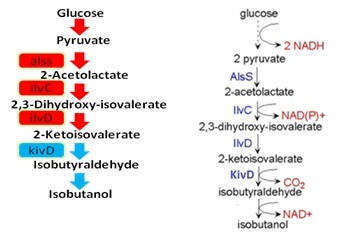 Isobutanol and isobutyraldehyde have biological toxicity and also can denature proteins,so we design a low temperature release system to stop at the step that produce 2-Ketoisovalerate.In our design, we put E.coli in 37°C and control the pathway by stopping the pathway when it reaches the step to produce non-toxic intermediate (2-Ketoisovalerate ) which we want to accumulate. Then under specific thermal control that moves E.coli to 30°C, the mechanism would continue to express isobutyraldehyde at once. The toxic isobutanol and isobutyraldehyde will produce at the last minute and cause less harm. Figure 3. When the temperature reaches 37℃, tetR will be expressed and TetR will inhibit ptet.KivD can't be translated. When being in 37°C environment, the first part will be translated and produced tetR protein to inhibit Ptet promoter and the first part will be translated to double terminator. The second part will not be translated because Ptet has been inhibited. Then we can accumulate non-toxic intermediate , 2-Ketoisovalerate,and it won't be toxic to E.coli. After getting enough 2-Ketoisovalerate ,E.coli will be moved to 30°C environment. The ribosome will not bind on the 37°C ribosome binding site and tetR genes will not be translated. Then promotor, Ptet, will not be inhibited. So the second part can be translated successfully. At the end , we can get the isobutanol . Finally we equipped the circuit on PSB3K3 backbone. We tried to find out the best condition for E.coli to product isobutanol.To maximize the isobutanol production, we optimize E.coli strains, culture medium, time, temperature and carbon source. Amazingly, our production surpasses the published reference whose production is 6.8g/L for 24 hr by using modified JCL16 strain（Smith KM, Liao JC, An evolutionary strategy for isobutanol production strain development in Escherichia coli,2011.）. Figure 4.Medium test: Incubated host cell (DH5α)in M9,M9T(M9+ trace metal mix) and M9TY(M9+ trace metal mix+ yeast extract)medium in 37℃.Until OD600 up to 0.5, we transfer to 27℃ environment(blue) to see which medium is the best to produce isobutanol. 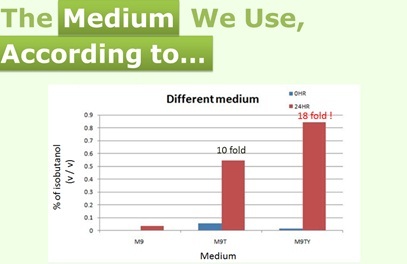 Data shows that when we changed M9 into M9T medium, the yield increased 10 times from 0.05% to 0.5%. Furthermore, when changed M9T into M9TY, the yield increased more than 50% from 0.5% to 0.8%! Consequently, M9TY is the most appropriate medium. 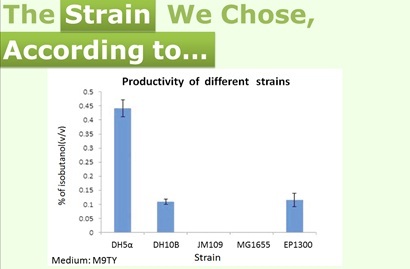 And, this medium conforms to the journal we refers to（Smith KM, Liao JC, An evolutionary strategy for isobutanol production strain development in Escherichia coli,2011.）, so we decided to use M9TY as our medium in our upcoming experiments. Figure 5.Comparison of isobutanol production obtained with DH5α, DH10b,JM109,MG1655,EPI300, incubating in 37℃,3.6% glucose, M9TY medium. Until OD600 reached 0.2(set as 0 hr), strains were cultured for 24 hours then measure the production by GC. According to the result (Figure 5. ), we knew that DH5α produced the most isobutanol. So, we choose DH5α to produce isobutanol on our upcoming experiments. Figure 6.This diagram explains our main idea in designing the experiment of the temperature control system. Green line means: 37℃(24hr); red line means: 37℃(12hr)27℃(12hr); blue line means: 27℃(24h). So, we can adjust different temperature and culture time likewise. In 2012, we even aimed to promote the yield of isobutanol production with our modified E.coli.So, we encode three kinds of zinc finger binding domain genes in front of each enzyme.It is showed in Part:BBa K887000.Zinc finger proteins contain a DNA binding domain and a functional domain. DNA binding domain could recognize specific DNA sequence, which called DNA program. Zinc fingers could tightly bind to specific DNA or RNA sequence. Thus, we connect the zinc fingers' functional domains with our enzymes to create fusion proteins for aligning the enzymes in order when the pathway is in progress. The first part of this complete biobrick is built in Plac, two strong and one weak expressing RBS, Alss, ilvC, ilvD, 37°C regulator RBS, tetR and double terminator. The second part of this complete biobrick is start with Ptet,one RBS,and end with terminatorPart:BBa_B0015 is included.